The Art Institute of Chicago is a magnificent building. You can feel the history with each step you take as you pass the two lions flanking the staircase up to the museum's front entrance. As landmarks of our great city, the presence of our lions indisputably reminds visitors that there is no need to wait until you are inside the doors to see great works of art. The lions were sculpted by Edward Kemeys, an American who was the first sculptor to devote his artistic career to portraying the animal life of the western plains and mountains. Created in 1893, the bronze lions were a gift from Mrs. Henry Field, sister-in-law to department store entrepreneur Marshall Field. 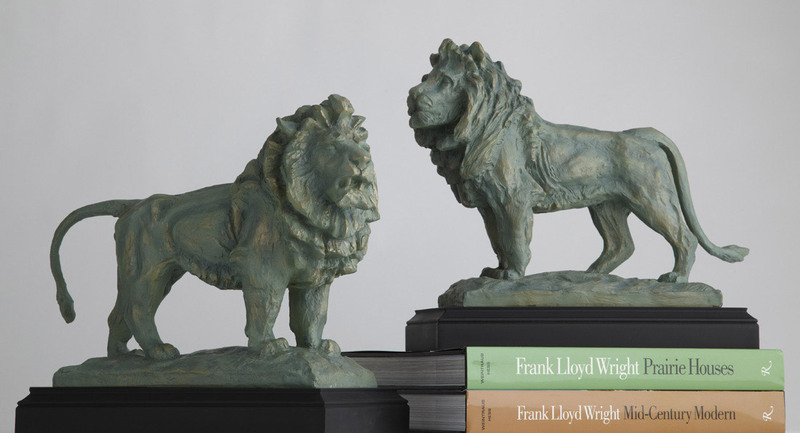 Just as the lions are a beloved icon of the Art Institute, so are the Museum Shop's Lion Bookends. Replicated in their infamous poses designed by Kemeys: "on the prowl" and "stands with an attitude of defiance", each is cast in polyresin stone and mounted on a wooden base. They exude the same proud elegance as the originals. Find these and many other reproductions from the Museum's collection here.